GRANT NO. 1: $21,500 to the R.E.D. Alliance. The R.E.D. Alliance’s mission is to address the disparity in breast cancer mortality rates of African-American women in Indianapolis through a collaborative approach, faith-based community outreach, and providing access to health care and resources. Similar efforts have been made in other cities with great success. We are thrilled that these efforts are being made in Indianapolis. As finding a cure for triple-negative breast cancer has always been a priority for the Catherine Peachey Fund, supporting the work of this organization fits very well with our mission. This $21,500 grant provides critical support for R.E.D. Alliance Director Lisa Hayes, including a laptop and the leasing of 10 tablets from Telamon Corporation. Why tablets? During town hall meetings and other events, the R.E.D. Alliance will share information and collect valuable data using these tablets. To help the organization try to determine where gaps are that are part of the disparity in mortality rates among their audience, R.E.D. Alliance will collect data related to patients’ medical tests, prescribed treatments and medical information. They will also ask about non-medical challenges such as transportation and childcare needs while being treated for cancer. It is easy to jump to the conclusion that the disparity is mostly socio-economic, but there is more to the story. During these events, resources will be shared regarding breast exam, mammograms or other breast health services to help connect women with free or low-cost, convenient services. GRANT NO. 2: $2,500 contribution to the Komen Tissue Bank’s 10th Anniversary Campaign for a new longitudinal study utilizing data generated from the tissue bank. This new study is aimed at making the tissue samples even more valuable to researchers, increasing the likelihood of lifesaving discoveries. This means the bank will ask a subset of tissue donors, past and future, to make a further commitment to regular follow-up questionnaires and possibly minimal additional periodic blood and/or tissue donations. WINE TASTING WITH PEACHEY 2017 was our best ever, raising over $3,000 for breast cancer research in Indiana. Dr. Milan Radovich spoke to our guests about the exciting work being done in his lab at the I.U. Simon Cancer Center, which continues to be supported by the Catherine Peachey Fund. Radovich is an assistant professor of surgery at the IU School of Medicine and researcher at Indiana University Melvin and Bren Simon Cancer Center. The Peachey Fund has provided grants to Radovich since 2010. The Radovich Laboratory, located in the Department of Surgery at the I.U. School of Medicine, is focused on the use of next-generation sequencing technology in translational oncology. In particular, they are using this technology to identify novel drug targets to better treat triple-negative breast cancer, inflammatory breast cancer and thymic malignancies. They are also using the technology to identify novel mutations that can help explain the causation of these diseases. More than 80 people attended Wine Tasting With Peachey 2017, with many new friends learning about the Catherine Peachey Fund and Heroes Foundation. 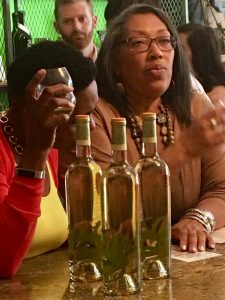 Plans are already underway for Wine Tasting With Peachey 2018 with ideas of how to continue to increase attendance and funds raised by the event. 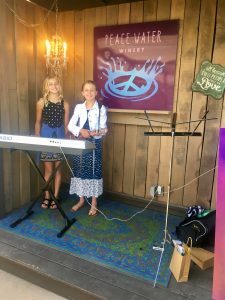 We are very grateful to Peace Water Winery in Carmel for their generous support of this event and to our event sponsors: Accessa, Joel and Julie Singer at Raymond James, Susan Kindig, and the Scherer Family. The Catherine Peachey Fund helped the KOMEN TISSUE BANK CELEBRATE ITS 10TH ANNIVERSARY during their celebratory event on June 21 at the Indianapolis Colts’ Indiana Farm Bureau Football Center. The Komen Tissue Bank is the only repository in the world for normal breast tissue and matched serum, plasma and DNA. By studying normal tissue, researchers can accelerate their research into the causes and prevention of breast cancer. The Peachey Fund had a display table at the event and passed out information about our work to attendees. Connie Rufenbarger, lead of the Catherine Peachey Fund Grants Committee, is one of the founders of the Komen Tissue Bank. The Komen Tissue Bank is located right here in Indiana at the I.U. Simon Cancer Center! The KTB continues to be a funding priority for the Catherine Peachey Fund. The Catherine Peachey Fund donated a JUST PEACHEY, BEARING FRUIT COOKBOOK TO EACH RALLY FORWARD PARTICIPANT during the August 23 tennis tournament at the Carmel Racquet Club. 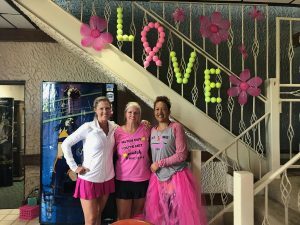 Annually, the CRC Rally Forward Team hosts a round robin tennis tournament to raise funds to support breast cancer research in the hope of cancer-free tomorrows. During the event, we shared information about the Catherine Peachey Fund and Heroes Foundation with all tournament players. This was a great opportunity to reach a new audience and share our mission and funding opportunities with them. Many thanks to the Rally Forward team for including us at this year’s event! 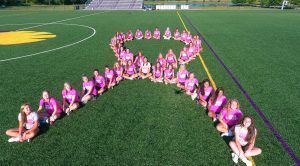 The GUERIN CATHOLIC AND LAFAYETTE CENTRAL CATHOLIC WOMEN’S SOCCER TEAMS are raising funds for the Catherine Peachey Fund during their Breast Cancer Awareness game on September 9 at Guerin Catholic High School in Westfield, Indiana. Please join us at the game! The JV teams play at noon and the Varsity game starts at 2 p.m. These amazing women are raising money for the Catherine Peachey Fund via t-shirt sales and a fundraiser at a local restaurant. We are incredibly grateful for their generosity! It is hard to believe that school is back in session and we are approaching autumn. PLEASE KEEP THE JUST PEACHEY: BEARING FRUIT COOKBOOK IN MIND for your corporate gifting needs during the holidays. We offer case discounts and free custom stickers for the cookbooks to highlight your branding and message. Contact Stephanie Lesher for details: slesher@heroesfoundation.org. Stephanie Rufenbarger Lesher leads the Catherine Peachey Fund, a programmatic member of the Heroes Foundation, and serves as a Heroes Foundation board member. GET HEROIC NEWS, EVENTS & MORE IN YOUR INBOX.